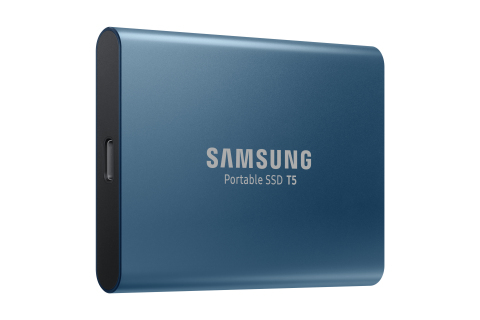 RIDGEFIELD PARK, N.J.--(BUSINESS WIRE)--Samsung Electronics America, Inc. today announced the introduction of the Samsung Portable SSD T5 – the newest portable solid state drive (PSSD) that raises the bar for the performance of external memory products. The T5, built with Samsung’s latest 64-layer V-NAND technology, delivers industry-leading transfer speeds with encrypted data security in a compact and durable design, making it easier than ever for consumers to access their most valuable data anywhere, at any time. Delivering stunning speeds of up to 540 MB/s1 – up to 4.9 times faster2 than external HDD products – the new T5 is designed especially for content creators, business and IT professionals as well as mainstream consumers to give instant, easy access to data. Also, the T5 is smaller than an average business card at 74 x 57.3 x 10.5 millimeters (3.0 x 2.3 x 0.4 inches) and incredibly lightweight at a mere 51 grams, comfortably fitting in the palm of your hand. The aluminum exterior comes in two distinct metal finishes – Deep Black (1TB and 2TB models) and Alluring Blue (250GB and 500GB models). The T5 comes with a three-year limited warranty and will be available globally Aug. 15 with a manufacturer’s suggested retail price (MSRP) starting at $129.99 for the 250GB model. For more information, please visit www.samsung.com/T5. Performance may vary depending on host configuration. To reach maximum transfer speeds of 540 MB/s, the host device and connection cables must support USB 3.1 Gen 2 and UASP mode must be enabled. Based on internal test results compared to an external HDD 500GB. Test system configuration: Asus® Strix Z270E Gaming motherboard, Intel® Core™ i5-7600 @3.5 GHz, DDR4 1066 MHz 4 GB, OS-Windows® 10 x64, Performance measurements based on CrystalDiskMark 5.2.1. Software requires Windows 7, Mac OS X 10.9 (Mavericks), Android 4.4 (KitKat), or higher. Older versions of the Windows, Mac, and Android operating systems may not be supported. Firmware update requires PC or Mac connection. 1 GB=1,000,000,000 bytes, 1 TB=1,000,000,000,000 bytes. Lower capacity may be demonstrated by your computer due to its use of a different measurement standard. Exact weight of product may vary by capacity. Software requires Windows 7, Mac OS X 10.9 (Mavericks), Android 4.4 (KitKat), or higher. Older versions of Windows, Mac and Android operating systems may not be supported. Firmware update requires PC or Mac connection. Available on Google Play. Samsung Electronics shall not be liable for any loss, including but not limited to loss of data or other information contained on Samsung Electronics product or loss of profit or revenue which may be incurred by user. For more information on the warranty, please visit www.samsung.com/portable-ssd. For Samsung Electronics America, Inc.